Pure Water Gazette » Road Salt: Where Does It Go? Road Salt: Where Does It Go? What Happens to All the Salt We Dump On the Roads? 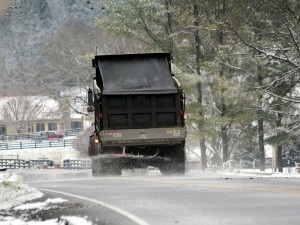 In the U.S., road crews scatter about 137 pounds of salt per person annually to melt ice. Where does it go after that? As much of the country endures from the heavy snowfall and bitter cold that has marked the start of 2014, municipalities in 26 states will rely on a crucial tool in clearing their roads: salt. Because the freezing point of salty water is a lower temperature than pure water, scattering some salt atop ice or snow can help accelerate the melting process, opening up the roads to traffic that much sooner. It’s estimated that more than 22 million tons of salt are scattered on the roads of the U.S. annually—about 137 pounds of salt for every American. But all that salt has to go somewhere. After it dissolves—and is split into sodium and chloride ions—it gets carried away via runoff and deposited into both surface water (streams, lakes and rivers) and the groundwater under our feet. Consider how easily salt can corrode your car. Unsurprisingly, it’s also a problem for the surrounding environment—so much that in 2004, Canada categorized road salt as a toxin and placed new guidelines on its use. And as more and more of the U.S. becomes urbanized and suburbanized, and as a greater number of roads criss-cross the landscape, the mounting piles of salt we dump on them may be getting to be a bigger problem than ever. Data from long-term studies of watersheds bear this out. A group of scientists that tracked salt levels from 1952 to 1998 in the Mohawk River in Upstate New York, for instance, found that concentrations of sodium and chloride increased by 130 and 243 percent, respectively, with road salting the primary reason as the surround area became more developed. More recently, a study of a stream in southeastern New York State that was monitored from 1986 to 2005 found a similar pattern, with significant annual increases and road salting to blame for an estimated 91 percent of sodium chloride in the watershed. Because it’s transported more easily than sodium, chloride is the greater concern, and in total, an estimated 40 percent of the country’s urban streams have chloride levels that exceed safe guidelines for aquatic life, largely because of road salt. This chloride can occasionally impact human water use, mostly because some penetrates into the groundwater we tap for drinking purposes. Water utilities most frequently report complaints of salty drinking water during the winter, when chloride concentrations are likely to exceed 250 parts per million (ppm), our tastebuds’ threshold for detecting it. This is an especially big issue for people on salt restrictive diets. Overall, though, road salt-laced drinking water isn’t a widespread problem: A 2009 USGS study found that fewer than 2 percent of the drinking wells sampled had chloride levels that surpassed federal standards. Road salt pollution is generally a bigger issue for the surrounding environment and the organisms that live in it. It’s estimated that chloride concentrations above 800 ppm are harmful to most freshwater aquatic organisms—because these high levels interfere with how animals regulate the uptake of salt into their bodies—and for short periods after a snow melt, wetlands nearby highways can surpass these levels. A range of studies has found that chloride from road salt can negatively impact the survival rates of crustaceans, amphibians such as salamanders and frogs, fish, plants and other organisms. There’s even some evidence that it could hasten invasions of non-native plant species—in one marsh by the Massachusetts Turnpike, a study found that it aided the spread of salt-tolerant invasives. On a broader scale, elevated salt concentrations can reduce water circulation in lakes and ponds (because salt affects water’s density), preventing oxygen from reaching bottom layers of water. It can also interfere with a body of water’s natural chemistry, reducing the overall nutrient load. On a smaller scale, highly concentrated road salt can dehydrate and kill trees and plants growing next to roadways, creating desert conditions because the plants have so much more difficulty absorbing water. In some cases, dried salt crystals can attract deer and moose to busy roads, increasing their chance of becoming roadkill. How can we avoid killing trees and making roadkill of deer while de-icing the roads? Recently, in some areas, transportation departments have begun pursuing strategies to reduce salt use. Salting before a storm, instead of after, can prevent snow and ice from binding to the asphalt, making the post-storm cleanup a little bit easier and allowing road crews to use less salt overall. Mixing the salt with slight amounts of water allows it to spread more, and blending in sand or gravel lets it to stick more easily and improve traction for cars. Elsewhere, municipalities are trying out alternate de-icing compounds. Over the past few years, beet juice, sugarcane molasses and cheese brine, among other substances, have been mixed in with salt to reduce the overall chloride load on the environment. These don’t eliminate the need for conventional salt, but they could play a role in cutting down just how much we dump on the roads. See also: Icy Roads Prescribed a Low-Sodium Diet.